SG-SEVAI Check dam aims to improve the quality of life of farming families in Vilkalpatty. Literacy skills have always been important. - Dr.K.Govindaraju, Chairman, South Zone Board of Continuing Education (OZONE). 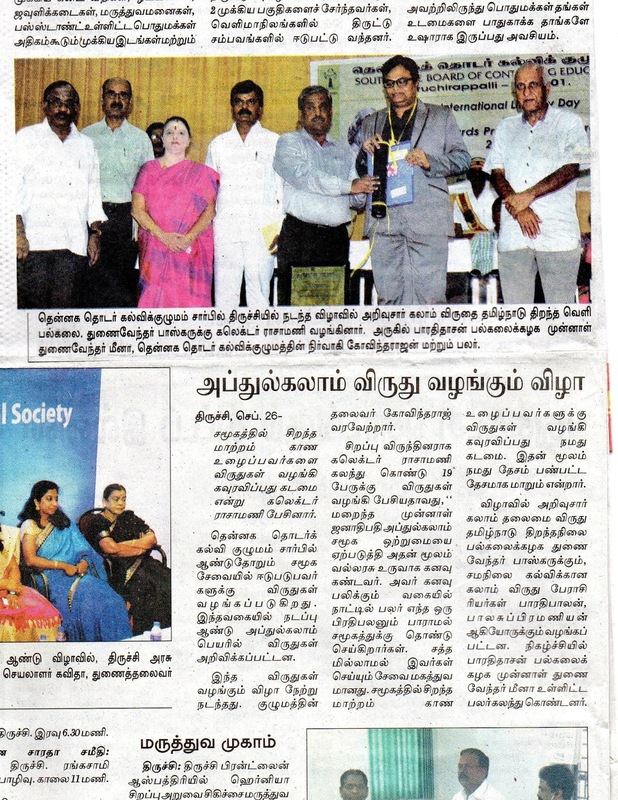 Trichy District Collector Shri.K.Rajamani presents Ozone -Kalam Awards . Chairman,OZONE, K.Govindaraju presents KALAM Memento to Dt.Collector Shri.K.Rajamani,I A S.
Kalam Award for Quality of Life Improvement 2016-17. Citation Mr.M.Subburaman,Sanitation Expert, Founder of SCOPE. M.Subburaman. is an expert in the field of Eco sanitation and he is the founder of SCOPE NGO.SCOPE an NGO based in Tiruchi, established in 1986 concentrates on rural development, empowering the marginalized women in rural areas found out soon that open defecation due to inability to construct toilets was one of the basic problems that prevented their economic development.The fast 5 years scope has been focusing on Ecological Sanitation and has Constructed over 2000 Ecosan Toilets on the banks of the rivers Ganges and Cauveri and in Tsunami hit Sandy coastal villages of Tamilnadu .Sevanthilingapuram on the banks of the sacred River Cauvery, about 35Kms from Trichy on Trichy- Musiri road, consists of three habitations, Sevanthilingapuram North with 201 dwellings, Sevanthilingapuram south with 87 dwellings, and Umayalpuram with 96 houses. Only 42 out of 246 houses occupied had toilets. Hence 80% of the villagers were forced to defecate in the open mostly on the banks of the River Cauvery and an irrigation canal flowing in Sevanthilingapuram. Residents of Sevanthilingapuram on seeing the excellent performance of the ECOSAN Compost Toilets in near by Kaliyapalayam were keen to go for ECOSAN Compost Toilets with financial support from UNICEF and State Government. So far in two phases 138 ECOSAN Compost Toilets have been constructed. With the help Auro Annam of Auroville (Pandichery) on the final phase ECOSAN Compost Toilets have been constructed in the 63 house also Sevanthilingapuram earning the distinction of being the First ECOSAN Village in the country. The South Zone Board of Continuing Education recognizes the outstanding services of Mr.M.Subburaman in the field of Eco-Sanitation..The South Zone Board of Continuing Education takes pride in conferring upon Mr.M.Subburaman Founder/Director, SCOPE, the Quality of Life Improvement Kalam Award for the year 2016-17 and the same is presented on 25 th September 2017 at Kalai arangam Triumanamandapam, Trichy on the occasion of International Literacy Day Celebration. The South Zone Board of Continuing Education, established in 2011, is born out of the ever-growing ambition andlogical resolve of the Founderto focus on socially relevant education, in general and purposeful continuing education, in particular in the Southern India (Comprising of Tamil Nadu, Puducherry, Karnataka, Kerala and Andhra Pradesh). The inspiration for expansion emanated from out of the long-time committed associationof the Founder with the governance, programmes and activities of the Tamil Nadu Board of Continuing Education (TNBCE) brought into existence by Dr Malcolm S. Audisehsiah in the early seventies, with its base in Chennai. Literacy is the backbone of a progressive society and the heartbeat of a developing nation. Only a literate nation can really be free from all kinds of social and other oppressions by opening up unlimited avenues and varied arenas of progress to everyone and empowering all, including those under the yokes of oppression.The idea of expansion has stemmed out of the understanding of the reality that the Government alone cannot be burdened to take care of all development programmes in each and every sphere of life in the region. This understanding also necessitates and redefines active participation of non-government organizations (NGOs) in various social development projects. Continuing education is one such field where NGOs can make very positive and significant contributions as evidenced by TNBCE in Tamil Nadu and similar bodies in the South Zone.The Continuing Education Scheme is multi-faceted and so are the programmes directed to achieve success in the sphere. Postulated on the principles of treating basic literacy, post literacy and later continuing education, many programmes are being planned, launched and continued. The schemes and programmes aim at positively addressing the socio-economic situations of the community and catalyzes provision of infrastructure for larger development initiatives. The South Zone Board of Continuing Education plans to provide strong academic and applicable technical resource support that would regularly benefit carrying out and sustaining continuing education efforts in the Zone. In a developing country like India, the Community Collegesstand for an alternative system of Education, which aims at the inclusion and empowerment of the disadvantaged through appropriate skills development to turn them more employable. As the Community College system is ‘of’ the community, ‘for’ the community and ‘by’ the community, the South Zone Board of Continuing Education has also proposals to link the Community College system of Tamilnadu Open University to cater to the needs of the various sections of the community. The proposed Community Colleges will be geared to offer and promote job-oriented, work related, skill-based and life-coping education. Committed to make lasting contributions towards nation building, the South Zone Board of Continuing Education’ has launched myriad kinds of Training Programmes, Continuing Education Courses, Population Education Programmes, Programmes for development of vocational skills besides several other special, comprehensive rural/urban development activities in the target areas. Since its inception, the South Zone Board of Continuing Education has been playing a significant pro-active role in creating an appropriate environment where women themselves are encouraged to demand and seek knowledge for their empowerment. South Zone Board of Continuing Education provides career oriented assistance to the community in several districts of Tamilnadu and is willing to extend activities beyond the state. The South Zone Board of Continuing Education has established useful working connections with NGOs serving for the promotion of Health, Animal Husbandry, Horticulture, Agriculture, Social Forestry, Rural Development, Social Welfare and Information and Education. The South Zone Board of Continuing Education has proposals to carry out the planned extension programmes in all necessary and possible sectors spreading them across the regions in the Zone. With the strength of governance, association and hands-on experience in TNBCE for over three decades, the founders are sure to achieve the objectives of extending socially relevant education and sustain continuing education to benefit various sections and regions in the South Zone. WE WELCOME YOU TO STAND WITH US AND GUIDE OUR EFFORTS. 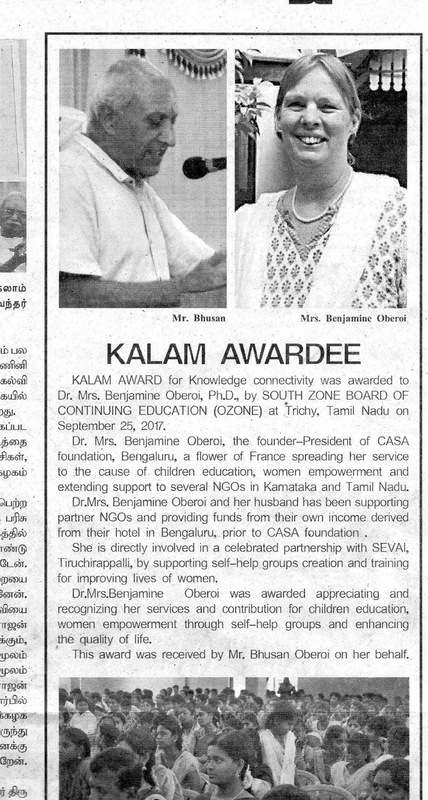 Dr.S.Bala Subramanian presented with Kalam Award. Bharthi Balan Dr. S. Balasubramanian Professor & Head School of Tamil and Cultural Studies, Tamil Nadu Open University,Saidapet, Chennai – 600 015. Bharthi Balan Dr. S. Balasubramanian is basically an educationist and writer of several life oriented books for Equivalency Education, Qulaity of Life Improvement and trained several young writers to author innovative lifelong education books.Barathibalan served in State Resource Centre and he published books for continuing Education. His works facilitate the international compilation and comparison of education statistics and take into account new developments and changes in education and anticipate future trends in the various regions of the world, such as the multiplication and growth of different forms of vocational education and training, the increasing diversity of education providers, and the increasing recourse to distance education and other modalities based on new technologies. Currently he holds significant position in Tamilnadu Open University as Professor & Head School of Tamil and Cultural Studies. He is a humble person and energy giving person for those in need. In Tamilnadu Open University Bharthi Balan Dr. S. Balasubramanian serves from TNOU inception. In TNOU, Tamil and Cultural Studies, Dr.S.Balasubramanian, P.hD Promotes the rich cultural heritage of Tamil through native Arts, Culture and Literature, infusing them with modern technologies with a mission, and offers Programmes through the state of the art technology for higher research studies in Language, Arts and Culture in tune with the society’s requirement undertakes Training and Research at the international standard with widespread knowledge and depth and make the outputs easily available and produce creative writers who will enrich Language, Arts and Culture with their contributions. The South Zone Board of Continuing Education recognizes the outstanding services of Bharthi Balan Dr. S. Balasubramanian. The South Zone Board of Continuing Education takes pride in conferring upon Bharthi Balan Dr. S. Balasubramanian Kalam Award for Equivalency Education Program for the year 2016-17 and the same is presented on 25 th September 2017 at Kalai Arangam Triumanamandapam, Trichy on the occasion of International Literacy Day Celebration. Mankena Srinivasa Reddypresented with Kalam Award. Mankena Srinivasa Reddy, Hyderabad is committed NGO leader working for empowering the VoluntaryOrganizations (NGO) sector at the grass roots level and catalyze their involvement in participative development efforts aimed at nation building. His association/membership in a number of National/State Level Bodies/High-level Committees of the Union Ministries of Rural Development, Environment and Forest, Railways, Ministry of Social Justice and Empowerment, Ministry of Finance, Ministry of Tele Communications and such are indications of the recognition of his services in different social sectors. Of late, Mr Reddy has commenced ardently promoting Organic forming, under CAPART RC in Hyderabad and is spreading the transfer of knowledge of Organic farming in the States of Andhra Pradesh and Telengana. The South Zone Board of Continuing Education (OZONE) takes immense pleasure in recording, appreciating and recognizing the services and lasting contributions of Mankena Srinivasa Reddy, Hyderabad ,Telengana State in the sphere of Knowledge Connectivity for NGOs. KALAM AWARD FOR KNOWLEDGE CONNECTIVITY for the year 2016-17. Mr.Bhusan Oberoi receives the Kalam Award on behalf of Mrs. Benjamine Oberoi. DrMrsBenjamineOberoi, Founder-President of CASA Foundation, Bangalore, is a flower of France spreading her fragrance of service to the cause of children’s education, women empowerment and support to NGOs in the states of Karnataka and Tamil Nadu, for over four decades. MrsBenjamine has strong experience in working with Indian NGOs, and her direct involvement in Objectif France Inde, a French not-for-profit Organisation comes in handy bringing much benefits to the NGOs in the Country. Prior to creating the CASA Foundation in 2011, MrsBenjamine and her beloved husband were providing funds and support to partner-NGOs through their hotel, the Casa Cottage, Bangalore.MrsOberoi, continues to support several Education projects in rural and slum areas for the children. 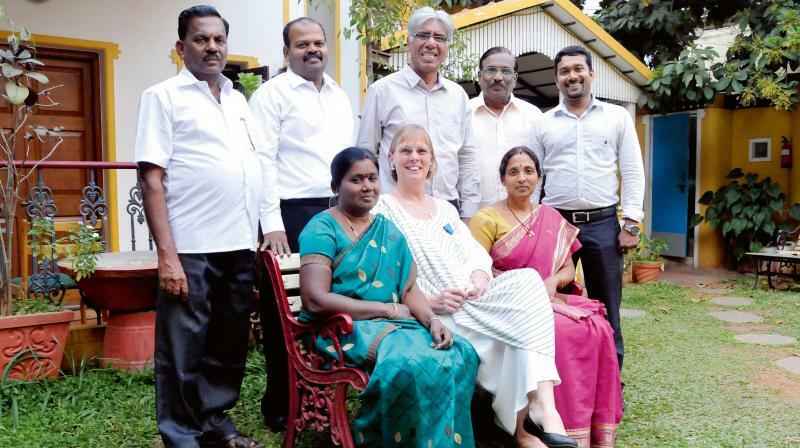 She is directly involved in a celebrated partnership with SEVAI, Tiruchirapalli and Building Blocks, Bangalore to provide education to disabled children, slum children and children from rural areas.MrsOberoi has been supporting self-help creation and training by SEVAI for improving lives of women. Mrs.Benjamine Oberoi with her Social work associates. The South Zone Board of Continuing Education (OZONE) takes immense pleasure in recording, appreciating and recognizing the services and lasting contributions of Dr. MrsBenjamineOberoiin the sphere of children’s education, women empowerment through Self-help groups aimed at enhancing the quality of life of people in Karnataka and Tamilnadu.The Board takes pride in conferring upon her the KALAM AWARD FOR QUALITY OF LIFE-IMPROVEMENTfor the year 2016-17. Shri. N.BalaGopal, Vice-Chairman of P.N.Panickar Foundation, Tiruvananthapuram, Kerala State, is a committed visionary successfully promoting Digital Literacy, Digital Library, Eco-wash, skill development and Jan Aushadhiprogrammes in rural pockets of Kerala State. DrBalaGopal has been steering the Foundation’s efforts strengthening the National e-Governance Plan and taking the ICT to the remotest corners of the State- extending meaningful access to the rural masses and empowering them to draw the benefits of the development of IT for inclusive growth and social inclusion.The flag-ship e-literacy programme of the Foundation has registered remarkable success turning several villages in Kerala cent percent e-literate and thus contributing towards Kerala state becoming the first e-literate state in entire India. The Foundation has e-invaded the villages impacting beneficial use of information and Communications Technology in every walk of life of the villagers. The South Zone Board of Continuing Education (OZONE) takes immense pleasure in recording, appreciating and recognizing the services and lasting contributions of Dr. N.BalaGopal of P.N.Panickar Foundation, Kerala State in the sphere of Community Outreach.The Board takes pride in conferring upon him the KALAM Award for Community Outreach for the year 2016-17. TNOU V C awarded KALAM Knowledge Connectivity Prime Award by Trichy District Collector. DrBaskaranMuthusamy, currently Vice-Chancellor, Tamil Nadu Open University is a distinguished Agriculture Scientist specializing in Seed Science and Technology and is a domain knowledge expert in the designing of various farm machineries including post-harvest seed handling equipments. With umbilical service links with Tamilnadu Agricultural University, he has served with distinction in various State and Central Government organizations for well over three decades. As Vice-Chancellor of TNOU, he has firmly set his priority to design and introduce skill-oriented and innovative add-on Courses for the benefit of the learners towards empowering them to establish connectivity with knowledge and skills needed for negotiating life situations.The South Zone Board of Continuing Education (OZONE) takes immense pleasure in recording, appreciating and recognizing the services and lasting contributions of Dr. BaskaranMuthusamy in the field of education, continuing education and enabling knowledge connectivity to the youth.The Board takes pride in conferring upon him the KALAM KNOWLEDGE CONNECTIVITY PRIME AWARD for the year 2016-17. Prof.Dr.P.Thiyagarajan, Ph.D.serves as Prof.Head, School of Continuing Education in Tamilnadu Open University. With the rapid pace of growth in science & technology and frequent paradigm shifts in policy, governance and management, Continuing Education of working professionals in the industry is a vital need. In recent times, the Continuing Education Programmes have also made their presence felt outside of the country, reaffirming their quality and outreach potential. While these programmes continue to promote the objectives of training and dissemination of knowledge related to the frontiers in technology & management, OZONE also views these programmes as forums to. Understand challenges and needs in technology & management more clearly to assist working professionals in widening their knowledge base and improving their skills and help make the Indian industries globally competitive, by providing training in critical and cutting edge areas., promotes strong industry-institute interaction and open new areas of cooperation leading to research collaborations, improve the skills of a large number of faculty in various technical institutions across the country, to enable them to improve the quality of the trained manpower coming out of such institutions, seek National and International partnerships in knowledge creation and its dissemination worldwide and to foster learning as a vehicle for innovations and growth. OZONE recognizes the services of Prof.Dr.P.Thiyagarajan, Ph.D.Prof.Head, School of Continuing Education.TNOU.The South Zone Board of Continuing Education takes pride in conferring upon Prof.Dr.P.Thiyagarajan, Ph.D.Prof.Head, School of Continuing Education.TNOU, the Kalam Award for Knowledge Connectivity for the year 2016-17on 25th September 2017 at Kalai Arangam Triumanamandapam, Trichy on the occasion of International Literacy Day Celebration. Dr.T.S.Ramkumar, Centre for Social Reconstruction: CSR,Nagarkoil is the founder/Director of CSR,NGO.CSR is a registered, non profitable organisation working in Kanyakumari and Tuticorin Districts of Tamil Nadu with vision to identity human potentially and promote human resource among the weaker section especially women and children through collective efforts and to empower marginally communities and facilitates them to build a sustainable society. Major Achievements are 1.Supported 3438 rural women to start income generation activities. 2.Promoted self sustained women federation with 7500 members at Thiruchendure. 3. 300 child labours were rehabilitated. 4. 25554 un enrolled children were enrolled in year in schools. 5. 5552 dropout children between in the age of 6 to 15 were reenrolled. 6. 864 children affected by HIV/AIDS and 71 children living with HIV were supported. 7. Working with 5000 high risk group members to reduce HIV/AIDS in Kanyakuamri district. 8. working with 475 Tribal children.CSR has been engaged in child enrollment campaign programme for cent percent enrolment of school age children and elimination of further school dropouts. CSR also started Child Labour Eradication Awareness about the evil effect of child labour and the need for its eradication. CSR implemented the HIV/AIDS prevention project among core group (FSW, MSM & IDU) with the support of Tamil Nadu State AIDS Control Society (TANSACS) in three blocks of Kanyakumari District. The current services offered for family planning is more through the public sector health service system. The South Zone Board of Continuing Education recognizes the outstanding services of Dr.T.S.Ramkumar through Centre for Social Reconstruction: CSR.. The South Zone Board of Continuing Education takes pride in conferring upon Dr.T.S.Ramkumar, Founder/Director, Centre for Social Reconstruction: CSR -Nagar Koil, the Quality of Life Improvement Kalam Award for the year 2016-17 and the same is presented on 25 th September 2017 at Kalai arangam Triumanamandapam, Trichy on the occasion of International Literacy Day Celebration. Serving as Coordinator, Swachh Bharat& Swasth Bharat, Alagappa University Served as Principal In charge, Alagappa University, College of Arts & Science,Paramakudi from 1410.2014 to 31.05.2015, Served as Organizer for cultural competitions organised for University Level as well as Intercollegiate level conducted by Cultural Club, Alagappa University, during the year 2013-14.He has published several books and served as Director of State Resource Centre with vast experience in the field of continuing Education.Dr.R.Rajan’s services in the field of Continuing Education is very much appreciated. and he got the outstanding AWARD of UNESCO for him and his SRC-team. The South Zone Board of Continuing Education takes pride in conferring upon DR.R.Rajan,Ph.D., Associate Professor, Department of Lifelong Learning Alagappa University, the Kalam Award for Knowledge Connectivity for the year 2016-17on 25th September 2017 at Kalai Arangam Triumanamandapam, Trichy on the occasion of International Literacy Day Celebration. Kalam Award for For Community Outreach 2016-17. Citation Mr.Jose Berlin, Russ foundation, Madurai is the founder of RUSS Foundation. Mr.Jose Berlin, Russ foundation, Madurai is the founder of RUSS Foundation.RUSS FOUNDATION is a charity. Russ Foundation concentrates its developmental efforts at the grass-root level in sectors like Health, HIV/AIDS, Education, Socio-economic development, Life-skill Vocational Training and Ecology. Russ Foundation is focused to create sustainable and culturally relevant solutions by enabling communities to break the longstanding obstacles for their development. The primary object of Russ Foundation is to improve the quality of life of the children, women and the community at large. Mr.Jose Berlin’s work with people to improve the living conditions and quality of life of individuals, families, and the community at large by providing access to varied services to needy people; irrespective of genders, castes and faiths. At home, the children are cared for by a dedicated team of staff, who all live together with the children as one family. Russ Foundation's aim is to have a completely eco-friendly campus, which we are achieving through the implementation of various organic farming methods. At present Russ Foundation runs twelve evening tuition centres based in different villages with the hope of further expansion. These centres are aimed at academically struggling students and school drop-outs. The students are most often from poor economic backgrounds and their parents are often illiterate. South Zone Board of Continuing Education recognizes Mr. Jose Berlin’s community outreach program. The South Zone Board of Continuing Education takes pride in conferring upon Mr. Jose Berlin, Russ foundation, Madurai is the founder of RUSS Foundation, the Kalam Award for Community Outreach for the year 2016-17on 25 th September 2017 at Kalai arangam Triumanamandapam, Trichy on the occasion of International Literacy Day Celebration. Kalam Award for Knowledge Connectivity 2016-17. Citation A.S.Sankaranarayanan,Managing Trustee of NMCT. NMCT is a Non Profit Organization registered as a Public Charitable Trust in the year 1988 under the Indian Trusts Act 1882.It covers the Geographical areas of Coimbatore District as regards to Integrated Livelihood Supports for Tribes, Care & Support for the HIV infected families, Health and Nutrition Education for Women & Children. Both Coimbatore and Tirpur Districts are covered for Targeted Intervention for Migrant Industrial Workers. Silai School Project covers 10 Districts namely Coimbatore, Tirpur, Erode, Krishnagiri, Dharmapuri, Nilgris, Dindigul, Karur,and Namakkal. .The areas of Environment Protection, Education, Health and Livelihood Development are focused on long term commitment with an integrated approach to address the underlying Social and Economic causes. NMCT has been focusing on achieving maximum impact in the areas of Health interventions and Livelihood generation. Around one thousand families infected by HIV/AIDS have been provided with care and support for treatment services, nutritional food supplements and health care activities in 8 blocks of Coimbatore district. The health and nutrition education in Anamalai block covering school and community children, adolescents & women has impacted thousands of children, adolescents and women in practicing healthy lifestyle through regular nutritious food. The targeted interventions among the migrant industrial workers in Coimbatore and Tirupur districts by and large supported and supplemented the efforts of the Government initiatives in reducing prevalence of HIV/AIDS in the above districts. The South Zone Board of Continuing Education appreciates the above projects implemented by Shri.A.S.Sankara Narayanan. The South Zone Board of Continuing Education takes pride in conferring upon Shri.A.S.Sankara Narayanan, Managing Trustee of NMCT, the Knowledge Connectivity Kalam Award for the year 2016-17on 25 th September 2017 at Kalai arangam Triumanamandapam, Trichy on the occasion of International Literacy Day Celebration.